I am helping mum clean up - long forgotten insides of the cupboards and caverns of old tin trunks in the attic. Or is it the recesses of our minds and hearts? A report card from school, a hand written term paper from my post - grad days. Remnants of old photos, books- leather bound and gold embossed classics that Baba had bought so indulgently for me. I now realise how he must have scraped and scrounged his tight salaried budget to buy me those jewels. Cheaper, but equally dear Enid Blyton and abridged Dickens, Bronte sisters, Laura Ingalls Wilder, Anna Sewell pop up to say hello. The bound selections of Reader’s Digest features that were our project one summer when Mother had got us to tear out sections of “It pays to enrich your word power” “Book Choice” and “ Drama in real life”, collate them and get them bound in marble grey marble print covers and maroon cloth stems remind me of the reluctance with which Dada and I did this task. But once we took these sorted collection of pages to the bookbinders near the Hanuman Vyamashala , we were fascinated by the craft and the process. We sat in the book binding shop watching the workers skillfully stitch the pages together and glue it all together with home made “lay” or glue made by cooking flour in water! Most of the workers seemed semi- illiterate or educationally underprivileged for book binding was considered a vocational trade taught to those who did not have the aptitude for “higher skills and education”. Little did those binders from socially or economically disadvantaged strata realise their contribution to education, reading, inculcating a love for reading and to a rich literary culture! I brush aside the cobwebs and impatiently swipe at the silver fish scampering across the pages. Flipping the dog-eared and yellowing stacks of the comics, I spy our favourite Phantom comics. I finally realise (and a quick Google search helped!) that the comic strip creator’s name is certainly Lee Falk- for the life of me I couldn’t figure out as a child if it was Talk or Falk- due to the stylized lettering! The ghost –who-walks, Kit Walker, Diana Palmer, Uncle Dave, Devil the Dog and Hero the white stallion, the wise pygmy Guran … I laugh suddenly when I see Mrs. Palmer- Phantom’s MIL saying “Tsk, tsk…” that’s how we learnt to spell this onomatopoeic expression! Oh look! This one is with the mesa- the tableland surrounded by the tall cacti in the arid desert. How did the Mexican desert end up in Africa?! But a more serious question used to torment me. In my little mind I used to be at a loss – how does Phantom end up atop the mesa?! The mesa reminds me of a dish waiting to see the light of the day in my I-photo library… a mesa of rice with black-eyed beans in harissa sauce! Blitz all the ingredients together into a paste. In a thick bottomed sauce pan heat the olive oil and fry the chopped onion. Add the soaked black-eyed beans and sauté for a few minutes. Add the prepared harissa sauce and cook a little more. Add the soaked rice and mix well. Pour 2 cups of boiling water into the mixture, salt and sugar and lemon juice and cook the rice as you would a pulao. You could cook it in a slow cooker as well. 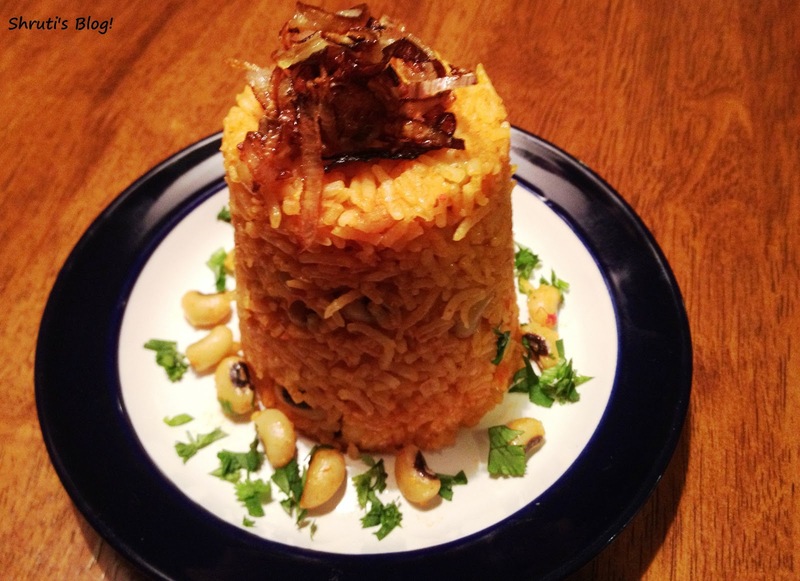 Allow the rice to rest for a while and then serve in moulded tabletops garnished with chopped coriander or parsley and fried onions. P.S – use any legumes- red lentils, mung beans or chickpeas. Add some pasta to the rice and serve it koshari style! lovely read shruti, as always. going thro' old comics and books boxes is like going into another world. one of my fav moments too. the recipe is great too. nice to see u back shruti. btw, did i send you my heartfelt sympathies for the lost tooth? what a lovely read shruti, as always. going thro' old books, comics in their old boxes is like going into another world. my fav moments too. a lovely recipe as well. will try soon. nice to see u back. btw did i send you my heartfelt sympathies on the lost tooth?